It’s fine to use @ Cris. The fridge is fine (and safe), just might add a little moisture to the icing, even if it’s in a container. Just stir well and check the consistency before you use it. Thank you soooo much for this tutorial! I might be back for more questions, but I’m trying this tonight! 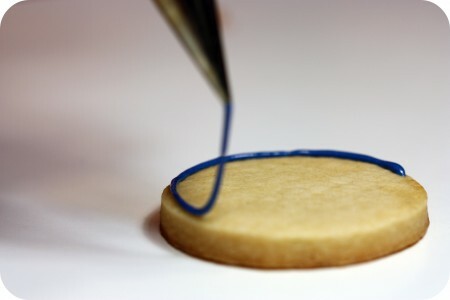 Do you change the thickness of the frosting depending if you are outlining or filling? I am going to try this and will be layering different colored frosting. 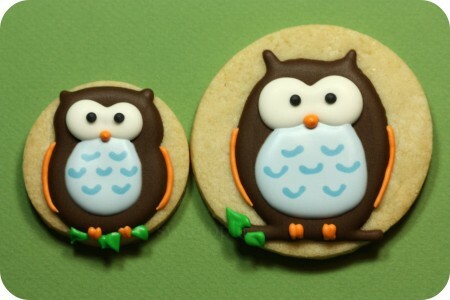 Any tips for making something like the owl cookie you pictured? How long before I can ice one color on top of another? Check my video section for how i find the consistency if you like as well. Hello. I have been having a mysterious thing happen when my royal icing starts to dry and wanted to see if this has ever happened to you or could give me some advice. After my icing starts to dry it ripples. It goes on nice and smooth and when I think it won’t do it it does. Any thoughts? This has happened every time I have made cookies over the past year but never before this. Cant figure it out. I absolutely love how royal icing makes decorating cookies easy and I can get clearly defined lines. But I can’t stand the taste. Other than dumping a whole container of extract into my next batch, what can I do to help it taste as good as it looks? @ kim: Hmm, it could be that you’re moving the cookie before it’s dry, or it could be that somehow just the top is drying really fast, thereby kind of causing a ‘stretching’ reaction. (is there a fan on them or something). I remember someone asking me about this about a year ago, and since it had never happened to me, i wasn’t sure of the answer, so asked on facebook. There were a ton of replies, and you’d think I’d remember, but I don’t, sorry. 🙁 If you want to go back through my facebook pages to see, or hopefully it’s one of the first two suggestions. @ Carmen: Taste is a personal thing, so it’s hard to say, but I like the recipe I use. Another suggestion is to use real lemon juice instead of extracts. Hi Marian! I am kind of new to Royal Icing (because the last time, icing didn’t dry up on cookies – humid condition). I just like to ask if you had the same consistency (10-count flood icing) used both for piping the outline and for filling? Because in the previous recipes I followed, they used a diff. consistency for each. Is 10-count good enough for both? Thank you! I tried doing both the sugar cookies and royal icing just this weekend and it came out fantastic! Although the sugar cookies were difficult to handle after a while when I put them outside the fridge. They easily became soft and hard to transfer from the pan it came from to the baking sheet, is that normal? But it might also be because of the weather here(I live in the Philippines – hot weather right now due to upcoming summer). However, I enjoyed the taste of the sugar cookies! And I did the butterfly wing-marbling that you had a picture tutorial about. Thanks, your site is very helpful. I am making a dessert magazine for a class, and one of my pages is how to ice cookies. I was wondering if I could use some of your pictures (with credit of course) to accompany it. Thanks for your help! 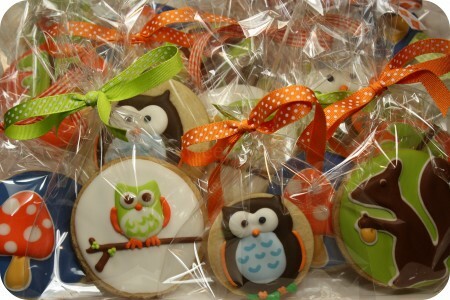 I love your owl cookies I am not able to get the owls to look good any ideas. How would you like me to credit it? I wasn’t sure if you wanted me to use your name or the blog name. A link to my site is fine (or sweetopia.net under the pics or something). I am new to cookie decorating. Yikes, it’s not as easy as I thought! I finally got the flooding consistency right. But now I have cookies with the outline that is bumpy and not consistent! Is there anyway I can save this batch. They are Easter eggs. Thanks! Hi @ Dale: Sorry, do you mean the icing is bumpy/lumpy? 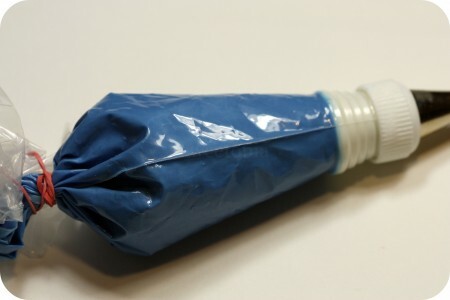 Wondering if Michael’s Stores carries royal icing in a writing tube? I have tips home if needed. If your chocolates are smaller and the letters need to be smaller then, you’ll need to use something different, most likely, as RI transfers are very fragile. 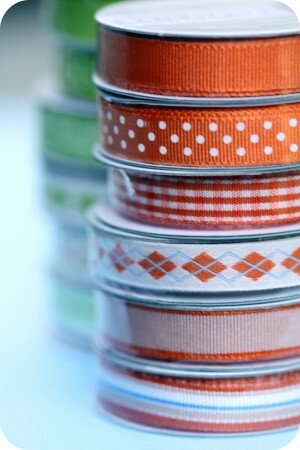 Maybe use fondant/gumpaste cutters, like tappits. ( http://sweetopia.net/2012/08/how-to-use-tappit-cutters-thank-you-nurse-decorated-cookies/ ) or you’ll need to pipe right onto the chocolate. For the piping, yes I think Michael’s carries royal icing in a writing tube. I’ve never tried them though… not sure how well they work, sorry. Hope that helps in general! Hi, I’m decorating hummingbird shaped sugar cookies and then hand-painting details. What is the best way to use multiple colors on a cookie? Is it possible to flood more than one color? I’d like the body to be green and blue, and then there’s the beak with black but I’m getting stuck thinking about how to execute this. Any advice or tutorials? Marian, what is a good small basketweave tip to use for a 2 1/2″ or 3″ Easter basket sugar cookie? not to mention the post was in fact a very good read. I have a question, I’m hoping you can help. Practically every time I make dots, big or small, they pit. How can I keep this from happening? I came across your site I want to say about two years ago and saw the butterfly cookie. I tried to make some cookies for my daughter’s princess themed party. I really wish I had taken the time to really read your blog because the cookies I made were horrible. As of yesterday I have taken the time to read, watch, and study your site and videos and will give the cookies a try again for her party in October. Thanks so much for taking the time to make these tutorials. I can’t tell you how great your website is. I recently made my first royal icing cookies using your recipes and tips. They turned out really well, especially for my first time. However making the icing proved to be rather time intensive because I had to add almost 15 times the amount of water suggested. I did it very slowly so that I wouldn’t thin it out too much. Is there some easier way to insure a proper icing consistency without spending 2 hours making it? The coloring and putting in piping bags is time intensive enough. 🙂 Thanks for any input. I’m in Lexington, Ky if that helps at all with knowing how weather may have a part to play. Hi Elizabeth, I will be doing a video on it, but it’s about 1/4 cup… give or take. It really does make a difference depending on the humidity level of the room. Hope that helps! Gorgeous party btw. How long should I wait after flooding the cookies before making the artwork over the top of it? 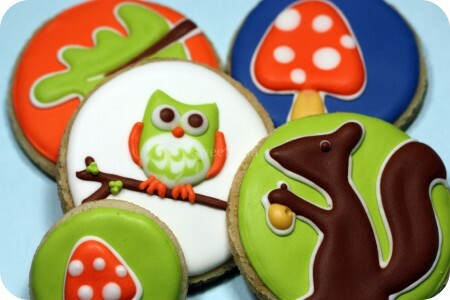 I have decorated many cakes and cupcakes…but….never cookies!! This will be totally new to me!!! I love your website! 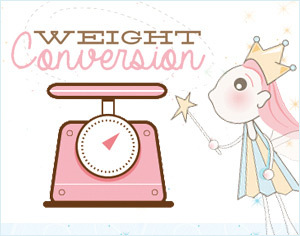 Fantastic tips!!! I do have a question, though! I usually flood my cookies and wait until they are dry to add piping details on the top. However, the small piping details on the top often aren’t secured onto the cookie well and tend to fall off with the slightest touch or bump (especially dots for eyes or a nose, polka dots, or small lines.) Any ideas? Should I not wait until the flood frosting is completely dry to add the piping details? You are an artist! they are beautiful! Hi, may I know is royal icing transfer best to use only for cake topper or can it still use to stick on cookie? I just watched it!!! You are like the dictionary to sugar cookie decoration….!! Big thank you!! Just found this wonderful website..THANK YOU!! 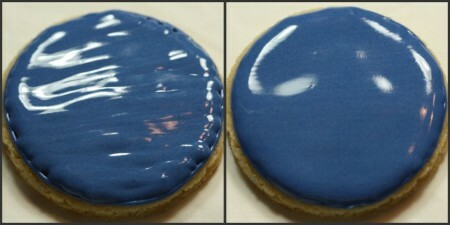 My question is how can I get the royal icing to have a sheen rather than the matte finish they always seem to have?..and also,how do I go about adding colored sugar to just the piping..do I need to put another piping layer on after the entire cookie is dried? I am so happy I found you! I am planning a cookie decorating party for my mothers group kids (nearly 3 years old) and though they will not be making cookies as beautiful as yours, I am hoping that I will. Your tutorials make it look so easy and I find the comments section to be super duper helpful as well. You’re amazing! This is what I’ve been looking for! I will include this into my Baby Shower food party! I am new to making homemade sugar cookies. What is the difference between royal icing and the others and when you leave the cookies to dry for 24 hours, where do you leave them, in the fridge or outside (covered, uncovered)? 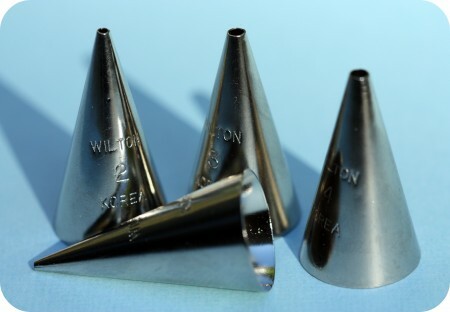 Also, what piping couplers are you using with your wilton number 2 tip? Hi there …I am a fan of your beautiful cookies and website. You truly have a gift! I recently started decorating cookies and have noticed that the small dots piped on and thin line details fall off after they’ve dried. I am very careful to ensure they’re completely dried before packaging them but they keep breaking off. Help! Thank you! I’m sorry to say, you’re probably doing nothing wrong… the dots are definitely sensitive! I wish I had a solution, sorry! Hi Marian, I want to add to my offer a holiday biscuits for doggies. I use only natural, preservatives free ingredients. I am looking for vegetable, fruit and herb coloring for the royal icing and color chart how to mix them to make any color. This is a new experience to me, please help if you can. P.S. Have a blessed Thanksgiving !!! Sorry I’m late with my reply! I’m sorry I don’t have any posts for you. Hope it went well and would love to hear about it if you already tried them!